My daughter had sent me Truffle Oil from Belgium while living overseas, I then set out to find a recipe or recipes where I could use the oil. It seems there are recipes all over the net using this product. This recipe is an adaptation from FoodNetwork. 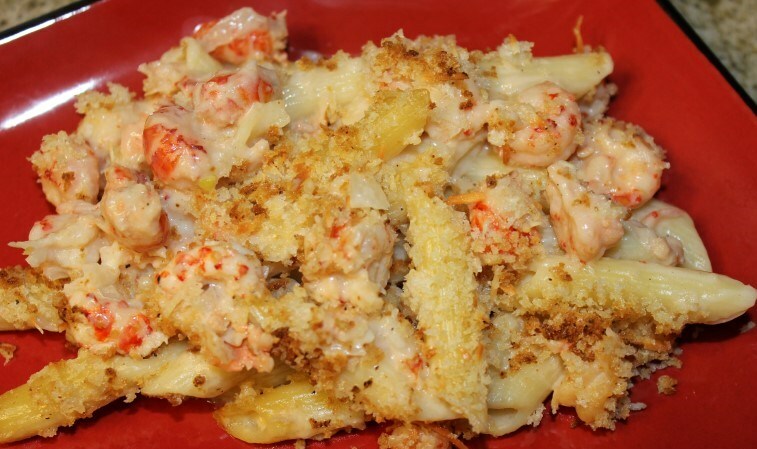 Although not original to Cajun culture but definitely French; we are incorporating this recipe in our Nouveau Cajun selection.In addition, you can still make this recipe and omit the truffle oil as mac and cheese always seems to be a favorite. From Wikipedia – Truffle oil is a modern culinary ingredient, used to impart the flavor and aroma of truffles to a dish. Most truffle oils are not made from actual truffles, but are a synthetic product that combines one of numerous aromas or odorants found in truffles, with an olive oil or grapeseed oil base. Truffle oil is commonly used to make “truffle fries,” which feature French fries tossed in truffle oil, Parmesan cheese, pepper, and sometimes other ingredients. Some pasta dishes and whipped dishes such as mashed potatoes or deviled eggs incorporate truffle oil. Heat two cups milk, one-half of the chopped onion, and the bay leaf in a large saucepan until tiny bubbles form around the edges; do not boil. Cover and remove from heat; let stand 15 minutes. While milk is resting, heat a large non-stick skillet coated with cooking spray over medium heat. Add the remaining chopped onion, cook, stirring frequently until golden. Add in crawfish tail meat and minced garlic and cook, stirring constantly for 4 minutes. Strain milk mixture through a colander over a bowl; set solids aside. Combine remaining 1/2 cup milk, salt, and flour in a small bowl or measuring cup, stirring with a fork until well blended. Gradually stir the flour mixture into crawfish mixture adding the onion solids, stirring constantly; bring the mixture to a boil, cook 1 more minute. Add red pepper if using. Remove from heat; allow to cool and thicken slightly. Gradually add Fontina and Gruyere cheeses, stirring until cheeses melt. Stir in the cooked pasta and truffle oil and then spoon the mixture into a 9×13 glass or ceramic baking dish. Combine Panko , Parmesan cheese, and garlic powder in a small bowl. Drizzle with olive oil; combine with a fork until crumbs are moist. Sprinkle breadcrumb mixture over pasta. Place dish on the middle rack in 375 preheated oven; bake 15-20 minutes or until top is golden brown and casserole is bubbly. Serve warm. Mild Provolone, Gruyere, and Gouda cheeses may be substituted for Fontina Swiss cheese and Jarlsberg,may be substituted for Gruyere.